Did you know that an anti-cancer diet can stop the chemical changes that lead to cancer? Recent research suggests that eating at least 5 servings of fresh vegetables and fruits every day reduces cancer deaths by 35%. That’s because there are phytochemical compounds in plant foods that offer powerful cancer protection. If you are looking for an alternative cancer treatment start with how you eat. These are the foods that prevent cancer. Sulforaphane – An anti-cancer compound that stimulates the antioxidant genes and enzymes and weakens the effects of free radicals. Slows down age related decline in immune function and helps to stabilize cholesterol levels. It is effective against the H. pylori bacteria, one of the worst bacteria that causes intestinal ulcers and stomach cancer. Normalizes hormone balance and supports liver detoxification. Prevents and interrupts cancer in many ways. Triggers cancerous cells to die, a process called apoptosis and raises your levels of enzymes that protect you from cancer causing substances. Researchers at the Strang Cancer Prevention Center in New York City found that when women took 400 milligrams of 13C a day which is about the amount found in half a head of cabbage – their levels of the harmless estrogen increased dramatically. This type of estrogen that 13C helps deactivate promotes tumor growth, notably in estrogen sensitive breast cancer. It can also slow the growth and reproduction of prostate cancer cells. Clearly in terms of breast cancer and prevention, eating the cruciferous vegetables daily is a priority. The evidence is compelling that eating more vegetables and fruits with these compounds is a good preventive measure. They need to be in your anti-cancer diet and are recommended by the American Cancer Society. * Consider this: you can add a small bunch of kale to any fruit smoothie made with unsweetened almond or coconut milk and you won’t even really taste it. Using some citrus fruit, like an orange will greatly enhance the flavor and disguise the green taste. This is a great way to get more fruits and vegetables into your anti-cancer diet. These beautiful red and golden vegetables contain cancer fighting phytochemicals: betacyanins, betexanthins and betanins. The bentanins inhibit free radical damage and inhibit the growth of breast, stomach, colon, lung and nervous system tumor cells. 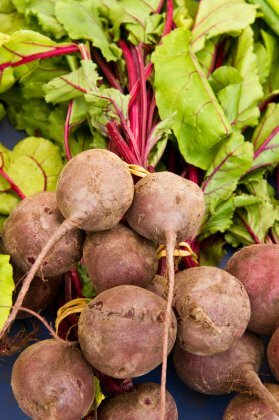 Eat beets raw, grated into a salad, or added into a green smoothie. Beets are very concentrated so a little goes a long way. Steam them or roast them and dress them with olive oil for a side dish. The golden beets are mild and especially good roasted and a great addition to your anti-cancer diet. Cabbage deserves more attention because it fights a variety of cancers and contains lots of other nutrients that protect you from a number of diseases. Like other members of the cruciferous vegetable family it contains compounds that prevent cancers from occurring. Cabbage is particularly effective in protecting you from cancers of the breast, lung and prostate gland. It contains indoles and sulforaphanes. Researchers have studied women from Poland who grew up eating raw cabbage, sauerkraut (fermented cabbage) and short cooked cabbage (5 minutes) and found that eating it as children made them 72% less likely to develop breast cancer. Eating it as adults provided significant protection from developing cancer as well. Bok choy and savoy cabbage have abundant beta-carotene as well which is a powerful antioxidant that protects you from cancer. All of the cabbage family vegetables need to be in your anti-cancer diet. Carrots have a phytochemical called falcarinol that reduces colon cancer risk. Carrots are also high in beta-carotene. Beta-carotene has been shown to stimulate the release of natural killer cells which hunt down and destroy cancer cells before they can do damage. Dozens of studies have shown that people who get a lot of beta-carotene in their diets can reduce the risks of certain cancers like lung cancer and cancers of the intestinal tract, mouth and gums. Cantaloupes, sweet potatoes, spinach and bok choy are all excellent sources of beta-carotene. Eat them raw as a snack, grated into a salad or spaghetti sauce or steamed lightly as a side dish. Add a little olive oil and roast them. Juicing carrots is a good way to get more beta carotene into your anti-cancer diet. Kale qualifies as a cruciferous vegetable and a dark leafy green and it is the queen of the anti-cancer greens along with broccoli. Dark leafy greens like kale and arugula and red leaf lettuce are a source of vitamin E and folate which are critical for the activity of neurotransmitters and discouraging the activity of tumors. I will put in a plug here for one of my favorite leafy green foods for your anti-cancer diet – watercress! This is a favorite of mine if you can find it in a grocery store. When I was growing up my mother told me stories of foraging for it in creek beds in Montana where it grows wild. It loves the water. Watercress has a wonderful peppery flavor and adds a lot to a salad and to your anti-cancer diet because it has wonderful detoxifying properties and has been proven in studies to reduce DNA damage to white blood cells. It increases beta-carotene and lutein in the body which protect against cancer. 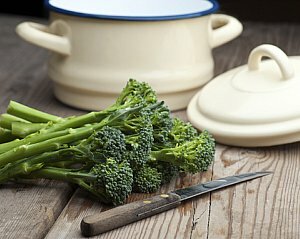 People who eat cruciferous vegetables, studies show have lower rates of cancer. Watercress is particularly potent in preventing lung cancer because it contains a natural compound called phenethyl isolthio-cyanate (PEITC) which provides protection against the harmful chemicals in tobacco smoke. PEITC is actually what creates the peppery flavor. This is according to a study done at the University of Minnesota Cancer Center in Minneapolis. Watercress has other anti-cancer compounds, one called methylsulphinylalkyl glucosinolate which turns off the development of cancer. Garlic blocks the growth of cancer cells! There is increasing evidence that garlic plays a role in preventing and treating cancer. Studies suggest that garlic can help block cancer in several ways by preventing the cell changes that lead to cancer; by stopping tumors from growing and by killing the harmful cells outright. Dr. Lin from the University of Southern California Norris Comprehensive Cancer Center suggests eating 3 cloves a day to reduce the risk of many cancers by 20%. A meta analysis of studies at the University of North Carolina showed that eating 10 cloves a garlic a week reduced the risk of colon cancer by 30% and stomach cancer by 50%. Studies at New York University Medical Center in the 1980s showed that garlic oil could slow development of skin cancer. How about adding some garlic to your daily anti-cancer diet along with many of the other vegetables talked about here for an overall sensible cancer protection plan? Garlic adds terrific flavor to so many dishes. You can roast a head of garlic which makes the cloves soft enough to spread on whole grain crackers or toast for a tasty snack or lunch. There is a compound in garlic called s-allylcysteine which appears to stop the metabolic action that causes a healthy cell to become cancerous, according to John Milner, PhD, who is chief of the Nutriton Science Research Group in the Division of Cancer Prevention at the National Cancer Institute in Bethesda, Maryland. Another substance that appears to stop the growth of cancer by interfering with the cancer cell's ability to divide and multiply is called DADS. It's a sulfur compound, diallyl disulfide which is also good for the heart and circulation. Yet another substance in garlic called DATS (diallyl trisulfide) is 10 times more powerful even than DADS at killing human lung cancer cells. Dr. Milner says that it's effectiveness is comparable to that of 5-fluorouracil, a widely used chemotherapy agent. Considering that garlic is a food and not toxic to healthy cells it seems as though it makes good sense to use it to kill cancer cells. In Asian countries mushrooms are a staple food and have been known to be useful medicinally since ancient times. When I was growing up only the button mushrooms were sold and eaten in this country. As our culinary arts have become more sophisticated and the world has become a smaller place, we have become much more adventurous eaters. There are many varieties of mushrooms available now at most super markets. This is a good thing because they are packed with important nutrients, stimulate the immune system and are important cancer fighters. Mushrooms reduce the risk of breast cancer by inhibiting the circulation of estrogen. So eating mushrooms may be helpful for breast cancer and prevention. According to researchers at the City of Hope, a Duarte, California cancer research and treatment center, they have found that mushrooms actually suppress estrogen production, particularly in post-menopausal women. Dr. Chen from City of Hope says that eating 3 ½ oz. of mushrooms a day as part of your anti-cancer diet, could help prevent breast cancer. You can usually find the tasty shiitake mushroom at any natural foods or Asian market. They’ve long been used in Japan to shrink tumors. Maitakes have been known for centuries to be helpful in treating people with cancer. These mushrooms contain an interesting molecule called a polysaccharide which is a complex sugar. Because it is similar in structure to a bacteria, the polysaccharides fool the body into thinking it needs to put it’s defense system on high alert. They are natural immune stimulants and need to be in an anti-cancer diet. When dried mushroom powder was ingested by laboratory animals with tumors, they inhibited tumor growth by a whopping 67%! According to Dr. Murphy, ND, a naturopathic doctor in Torrance, California we should include ½ cup cooked maitakes or shiitakes frequently in our anti-cancer diets. Parsley is a good source of folate which protects you from heart disease and cancers of the colon and cervix. Parsley also contains an abundance of vitamin C which is a powerful antioxidant. 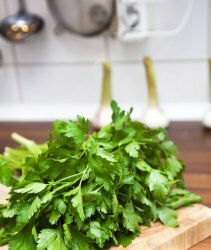 There are lots of ways to add parsley into your anti-cancer diet. You can add 1/2 cup to spaghetti sauce and 1/4 cup chopped parsley to any soup will add flavor and nutrition. Sea vegetables, like wakame, dulse, nori, kombu and arame are known for their anti-cancer properties. I know these are not foods you are likely familiar with but they can be found now in natural foods stores usually dried in small packages. You can crumble them and add to salads or reconstitute for a tasty broth to get them into your anti-cancer diet. One of the anti-cancer substances contained in them is chlorophyll which can help reverse the damage to DNA caused by cancers of the colon, breast and lung. It’s possible the reason Japanese cancer rates are so much lower than our’s in the U.S. is because they eat lots of sushi which is wrapped in nori and many other sea vegetables in soups and in salads. Nori is very high in vitamins C and A which are strong anti-oxidants. Some of these seaweed also contain polysaccharides which are wonderful immune system stimulants. 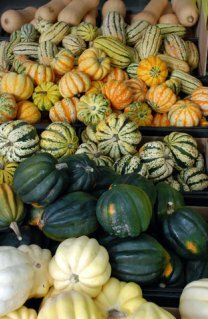 Squash can prevent lung problems and reduce the risk of endometrial cancer according to Dexter Morris, MD, PhD, associate professor in the department of emergency medicine at the University of North Carolina School of Medicine at Chapel Hill. Squash is an excellent source of both vitamin C and beta-carotene which makes it an excellent choice for an anti-cancer diet. The butternut squash contains the highest amount of vitamin C of the squashes. Squash is also high in insoluble fiber. Besides other healthful benefits in keeping the colon functioning properly, squash is known to be essential for reducing the risks of certain types of cancer, particularly cancer of the colon. Fiber assists in trapping cancer causing substances in the colon. It takes them with it as it is excreted from the colon. By soaking up water in the digestive tract it keeps the stools moving along quickly so any harmful substances will not harm the lining of the intestine. Beans, besides containing a lot of fiber, also have cancer fighting properties and are a staple of the anti-cancer diet. There is less incidence of cancer in people who eat a lot of beans! Amazing. Beans are high in magnesium and a University of Minnesota study found the women who ate the most high-magnesium foods reduce their risk of developing colon cancer by 23%. Beans contain phytoestrogens which according to a study from the M.D. Anderson Cancer Center in Houston can help people reduce the likelihood of getting lung cancer. For men as much as 72% and for women 41%. Lignans are a form of fiber that help to lower cholesterol. There are lignans in green beans. The other thing that’s great about beans is that they contain protein, not all the amino acids but some, so they can be eaten instead of meat when combined with other foods. If you combine them with brown rice, seeds, wheat, corn or nuts they make a complete protein with all the amino acids. Eating less meat is a good idea on an anti-cancer diet because you will get less saturated fat. Don’t think you have to eat black beans or pintos necessarily if you have a sensitive digestive tract. Lentils are delicious and very mild. Just cook them 15 minutes and season with olive oil and salt and pepper. One cup of lentils provides you with 17 grams of protein. According to the National Cancer Institute of the U.S. government’s National Institute of Health, tea contains polyphenol compounds the antioxidants which are essential for cancer prevention. One of these, EGCg or epigallocatchyine, is particularly potent for disease protection. I believe it is enough reason to recommend green tea as the best choice for a hot beverage for someone interested in the best anti-cancer diet. The anti-cancer diet prevents cancer and obesity and a host of other diseases. An optimum diet is the first step in an alternative cancer treatment plan and it happens to promote fat loss too! Perhaps we would need less chemotherapy and radiation and certainly less FEAR if people were made aware of these foods that prevent cancer. So what is it that causes cancer? Every day we are exposed to toxins in our environment and in unhealthy foods which produce free radicals inside of us. They are oxygen molecules that have lost an electron and go careening around your body looking for a replacement. These free radicals can damage healthy cells and kick off the cancer process. Nature’s way of combating free radicals is with antioxidants which are protective compounds that disable them and stop the formation of cancer cells. Rather than considering this to be an "alternative" plan, make it a part of your holistic cancer treatment and always consult with your doctor. The American Cancer Society recommends eating 5 or more servings of fruits and vegetables a day, to seriously limit your intake of processed and red meats and to choose whole grains over processed grains. They also recommend exercising a minimum of 30 minutes a day. You will do best to eliminate sugar and all high glycemic foods. Sugar feeds cancer. While eating the right foods is the most important factor in cancer prevention; there are some glyconutrients made from real foods that are bioavailable that will provide you with optimal immune system support. According to the Harvard University School of Public Health, poor diet, lack of exercise and unhealthy lifestyle elements are responsible for about 65% of cancer deaths! These are the foods that fight fat and prevent cancer. Keep reading for great ideas to prevent disease and obesity! Most people who are overweight are very acidic and need to eat more alkaline producing foods. Return from Anti-Cancer Diet to Food Nutrition Facts. Return from Anti-Cancer Diet to Lifetime Fat Loss home page.